It didn’t seem right. Why would a New York City teacher with benefits and a pension leave a full-time post right before Christmas? Everyone knew that Bushwick was a dangerous part of Brooklyn, and terrible thoughts and speculation began. Was the teacher even alive? Had she been…killed? Thus began Meryl Meisler‘s artist statement for her 2011 Soho Photo Gallery show, but in 1981 it was a real concern. She’d had one camera stolen–not on the street, but in the classroom where she taught on the Lower East Side. 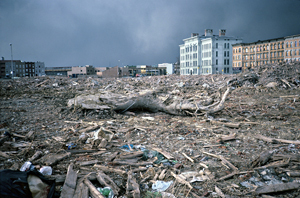 But Bushwick, an area in north Brooklyn bordering on Bedford-Stuyvesant and Brownsville, was worse. Tourist guides left it out. No one wanted to go there. Meisler hesitated, but knew if she didn’t take the job, she’d slide to the bottom of the Department of Education’s list. She said yes. In 1981 fear ran through the city. Dark days lay behind (the ’77 blackout, near bankruptcy, crime), and dark days lay ahead (more crime, AIDS, and crack cocaine). Every section was on edge, but some were worse than others. Bushwick was widely considered the worst. At least a few politicians ventured to the Bronx for photo ops (most famously Jimmy Carter in 1976), but no one went to Bushwick. Many of the problems were citywide. From 1973 to 1976, New York lost 340,000 jobs,** and in 1975 came close to bankruptcy. 1976 saw the worst crime stats ever, as well as the debut of New York’s infamous serial killer, Son of Sam. How bad could it get? Worse. On July 13th 1977, Meryl Meisler and a friend were planning to boogy down at Studio 54 to the throbbing disco beat of Donna Summer and KC & the Sunshine Band. But any sunshine New York had was fading fast and it was about to get very, very dark. At 8:37 p.m., lightening struck power lines at a substation in Westchester, triggering a short. *** As Con Ed managers struggled and failed to readjust electrical loads, lights winked out all over the metropolitan area. As Meisler and her friend pedaled uptown, the night seemed to grow thicker. By the time they reached Studio 54 and found it closed, and a great darkness–vast, enveloping and complete–had settled like a shroud over the City of New York. In the chaotic looting that began, Bushwick was the epicenter. In the main shopping district along Broadway (named after Manhattan’s famous avenue), stores were cleaned out and many set on fire. 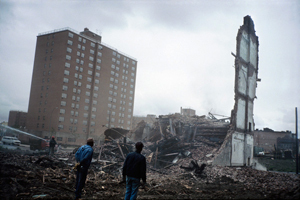 When the anger and darkness and burning were through, Bushwick, an area that had clung to its working class identity, lay in ruins. For New York, the blackout represented rock bottom, the moment when all the terrible trends that had been gathering coalesced into one giant, awful photo op that the world, country and city could no longer deny or turn away from. Something–many things–had to be done. 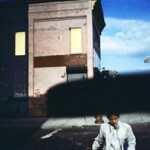 By the time Meryl Meisler arrived in 1981, Bushwick had cooled down and settled into its role of urban ghost town. Photographic series exploring urban decay often feature great swaths of graffiti-covered brick, but in Bushwick, many walls simply weren’t there. The first thing that strikes you in her images from this time is the amount of rubble. It’s everywhere, all over the place–blocks and blocks of it–pierced by an occasional tottering facade or low cluster of houses that seem to lean against each other for support. There is a sense of eerie quiet, almost peace; you feel as if the images were taken in some distant war-scarred city, not a few miles from the financial center of the world. Meisler took it in with an unflinching eye, coming to appreciate it’s strange beauty. There were ruins that rivaled anything from ancient Rome, a pure light unimpeded by tall buildings, magnificent backgrounds of clouds and sky. The surviving structures “whispered stories” and seemed to be “waiting for their portraits.” Meisler obliged. There were also street scenes reminiscent of small town life, filled with people who despite poverty, went about their lives and conveyed a sense of joy. That is what she focused on. 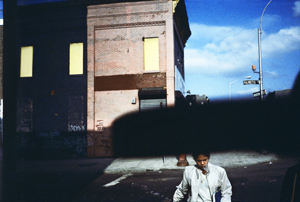 Using a low-cost point-and-shoot camera with cheap slide film, she began photographing on her way from the subway to the school, then back again on her way home. She was polite, always asking permission. 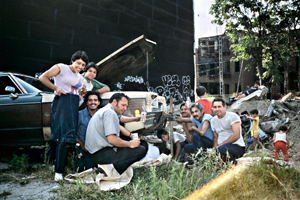 When urban historian, Adam Schwartz, was planning a show on Bushwick in 2006, her name came up, and the little boxes of slides began to come out of the basement. Looking at the magnificent output, it’s easy to forget Meisler had a day job, but she did, and took it very seriously. She has won many awards, including a Disney American Teacher Award, an Adobe Youth Voices Grant, a Chase Active Learning Grant, and a New York Foundation For The Arts Fellowship. She also started a photography program at I.S. 291, integrating “the children’s personal stories, health topics and…the history of the neighborhood.” Students’ work was exhibited in storefronts, parking lots, and projected onto building walls, in addition to being shown alongside the work of famous artists in galleries and museums. And Meisler also learned that her predecessor, the teacher many presumed dead, was alive and well and working nearby in Bushwick. 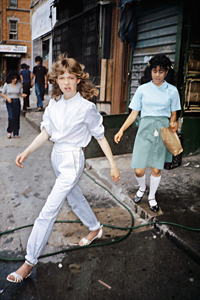 Meisler has had several shows of her Bushwick work at the Living Gallery and Bizarre, which also published her two books (A Tale of Two Cities: Disco Era Bushwick, and Paradise & Purgatory SASSY ’70s Suburbia & The City). On February 25, an exhibition of Meisler’s earliest work of family and friends in her hometown of Massepeaqua and 1970′s nightlife will open at the Steven Kasher Gallery, 515 West 26th Street in Manhattan. It will run through April 9, 2016. Sing praise to the brave women of this world who strive forward, throw fear aside and EXPLORE the unknown. We honor and remember them always.